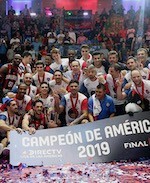 San Lorenzo celebrated Liga Americas title. They beat Mogi das Cruzes in the championship game. It looked good early as Mogi took a 5-point small lead at the end of first quarter. But then San Lorenzo had a 20-13 second period charge getting the lead and Mogi was not able to take back game control losing it eventually 71-79. San Lorenzo made 18-of-18 charity shots (100 percent !!!) during the game. San Lorenzo outrebounded Mogi 41-25 including 29 on the defensive glass. Worth to mention a great performance of forward Gabriel Deck (199-95) who helped to win the game recording a double-double by scoring 22 points and 10 rebounds (made all of his ten free throws !!!). Point guard Nicolas Aguirre (188-88) contributed with 11 points, 9 rebounds and 9 assists for the winners. Four San Lorenzo players scored in double figures. American-Brazilian point guard Larry Taylor (185-80, college: Missouri Western) answered with 20 points, 5 rebounds and 5 assists and American forward Tyrone Curnell (203-88, college: Valdosta St.) added 22 points and 5 rebounds in the effort for Mogi. Regatas Corrientes nipped Estudiantes to clinch the Bronze medals in Liga Americas. The guests trailed by 1 point after first quarter, but they rallied back to get the 5-point lead at the halftime and eventually won the game 60-59. Regatas Corrientes outrebounded Estudiantes C. 42-30 including 33 on the defensive glass. Guard Juan Arengo (190-96) fired 11 points, 7 rebounds and 7 assists for the winners. American guard Alex Harris (196-86) chipped in 18 points. American swingman Anthony Smith (195-86, college: Liberty) produced a double-double by scoring 16 points and 11 rebounds and Spanish center David Doblas (206-81) added 10 points and 10 rebounds respectively for lost side.